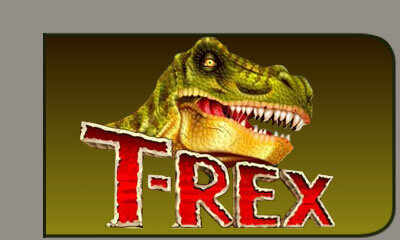 T-Rex Slot game uses RealTime Gaming software and consists of 25-paylines and 5 reels. The theme to T-Rex is a primitive Earth-theme which includes all your favourite dinosaurs, including a stegosaurus and ankylosaurus. Wild T-Rex in reel play, only occupies 3 reels, but discover 3 Scattering dinosaur eggs and enter the free spins round where the tyrannosaurus takes over by eating the smaller beasts. looking for something a little different and enjoy free spin slots then T-Rex is definitely worth trying out.